Manage mobile phone budgets with help from this AT&T Prepaid refill card. 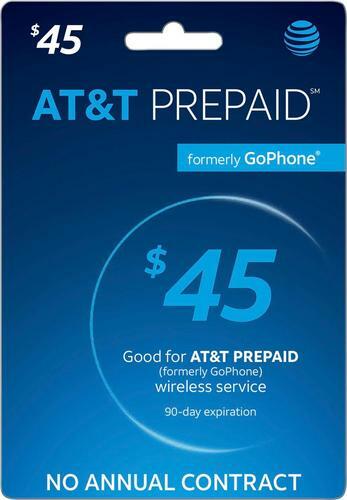 Use this $45 yourself or give it as a gift, and use the value toward services via compatible pay-as-you-go phones from AT&T. This AT&T Prepaid refill card lets you access additional voice minutes, text messages and some games. FeaturesCompatible with most AT&T Prepaid mobile phones For wide-ranging use. Redeemable for talk time, text messaging, games and other AT&T Prepaid services To help you keep in touch with friends and family. $45 value For flexible spending.